November is one of the only times of year that is set aside for everyone to be thankful. We are thankful for food, family, and football. But especially right now, many people seem to be struggling with thankfulness. Maybe they aren’t thankful for our President Elect, their job situation, the fact that Texas doesn’t have a real Fall…the list could go on and on. But teenagers and our kids are watching us! If we aren’t thankful, why should they be? This holiday season, let’s be intentional about our thankfulness. Maybe this year, we need to step up our game and make it more than a just a Thanksgiving Day deal. Being thankful can be an everyday thing! In fact, there are several ways that thankfulness and gratitude can positively affect your quality of life! Include them in the Thanksgiving preparations. Thanksgiving is a holiday that takes a lot of hard work, cooking and preparation. When you’re a little kid, it’s awesome because you get to sleep in, watch the Macy’s Thanksgiving Day Parade, and be served food followed by pie. However, it is time for us to get our children, and especially teenagers, involved in the day. If you’re like me, I am even more thankful for things when I know how much work and effort went into making it happen. Plus, this is a family holiday! Take advantage of that family time by passing on family recipes and traditions in the kitchen! 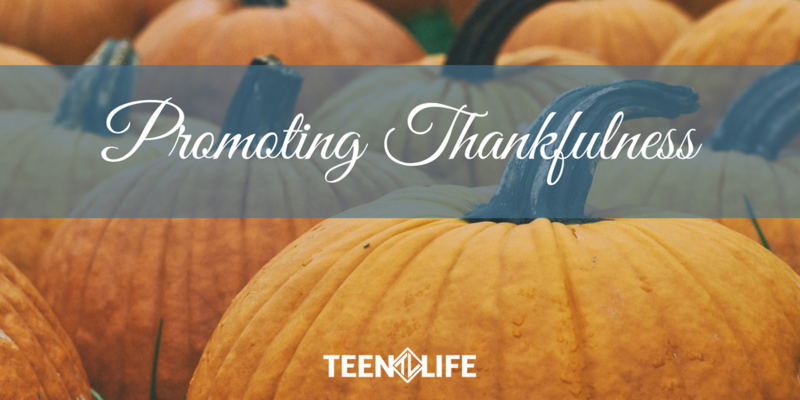 There are easy ways to get teenagers involved in making Thanksgiving dinner a success! Be intentional about the way your family talks about thankfulness. A great way to do that is to create a family activity that everyone can participate in. Maybe you get a paper or cheap fabric tablecloth that your family can use for the month of November. Every time your family sits down to eat together, have everyone write something that they are thankful for on the tablecloth. This is fun to see what you have been thankful for over a short period of time, and you can even keep the tablecloth for the next year! Another idea is to create a thankfulness tree. This is a great excuse to put up your Christmas tree a few weeks early, or you could have a separate, smaller tree just for thankful words. Each day, have your family (or each member of the family if you are really thankful) decide on something you are thankful for and write it on an ornament. Decorate your tree with things you are thankful for before you fill it with presents! Perhaps your thankfulness activity is something as simple as asking each family member to pick something they are thankful for and share it every night before bed. It does not have to be elaborate for it to be meaningful! Give back to others in need. Sometimes it is easier to be thankful for what we do have when we serve people who have less than us. Growing up, service was a big part of what my family did together. We went on mission trips, adopted families at Christmas time and served the homeless on different occasions. These are opportunities for you to not only talk about your own blessings, but to also create family memories that will have a lasting impact. Go shopping for canned goods and help your local food pantry stock their shelves. Ask if they need any help! Serve a meal at a soup kitchen or homeless shelter. Request a M.A.G.I. box and fill it with goodies for a child in need. Go through your closet and donate your old coats and sweaters. Surprise a family by paying their grocery bill or pay for the person behind you in the drive-thru of your favorite restaurant. Whatever you decide to do, serve as a family and take advantage of the conversations that can come out of this experience! Are you willing to try any of these things to promote thankfulness? What other ideas have you used to make the holiday season extra special?